Formula 1 Abu Dhabi GP 2018 Live Stream, Schedule & Live Telecast Info: F1 Season Finale In Abu Dhabi, Will Get to Ferrando Alonso for One Last Time In F1. The thrilling season of F1 race has come to an end as we reach Abu Dhabi for the season finale. It has been yet another strong year for both Mercedes & Lewis Hamilton. Mercedes grabbed the constructor title for the fifth straight time. And Lewis Hamilton successfully defended the driver’s championship against rival Sebastian Vettel. One of the ace drivers Ferrando Alonso will be retiring coming Sunday. Alonso will race for one last time before bidding goodbye to his illustrious F1 career. The race is scheduled to take place from November 23rd to November 25, 2018. Sportsfeista brings you Formula 1 Abu Dhabi GP 2018 Live Stream, Schedule & Live Telecast Information. The live telecast of Formula 1 Abu Dhabi Grand Prix 2018 in Canada is on TSN. Star Sports Select/HD will broadcast the race in India. US F1 viewers will need to tune into ABC & ESPN to catch the final race. Sky Sports and Channel 4 will telecast the final race in the United Kingdom. beIN Sports Arabia will telecast the race in the Middle East & North Africa. Australian viewers will be able to watch the race on Network Ten & Fox Sports. Sky Sports will broadcast the race in Ireland, Italy, and Newzealand. French Formula 1 fan will be able to catch the race on Canal+. Fox Sports will telecast the coverage in Asia. In Germany, the race will be on RTL & n-TV. F1 Abu Dhabi Grand Prix slated to take place between 23rd November to 25th November 2018. The driver championship and constructor championship are already decided. Lewis Hamilton became the 5-time world champion and Mercedes took the constructor title. 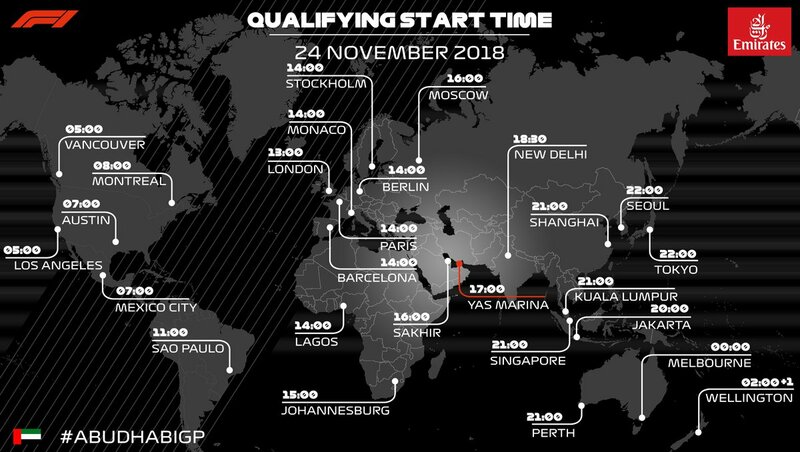 All timings are given in local Abu Dhabi time which is GMT+4. Indian fans will get to see the final race on Sunday, November 25, 2018, from 18:40 to 20:40. The first Grand Prix at Yas Marina Bay circuit took place in 2009.